GE Aware is a comprehensive line of sensors that offer solutions for almost any application. 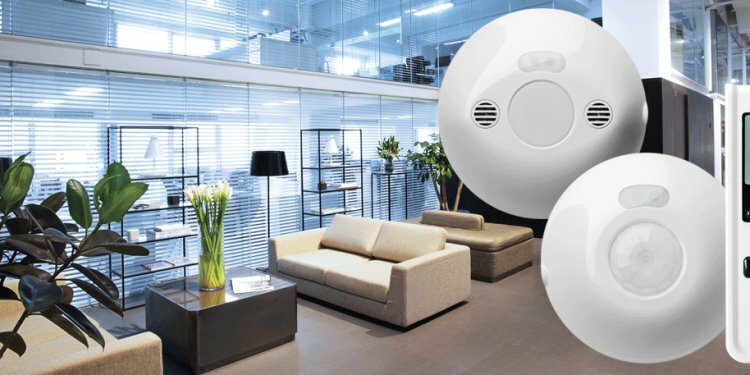 Whether you need a sensor that is commercial or industrial, indoor or outdoor, ultrasonic or passive infrared – or both – you're sure to find it with GE Aware. *A Meta-Analysis of Energy Savings from Lighting Controls in Commercial Buildings, performed by Lawrence Berkeley National Laboratory and Erik Page & Associates, Inc., 2011. Occupancy sensors go a step beyond scheduling by detecting motion within a space and switching the lights On and Off as needed. Occupancy sensors are ideal for spaces that are intermittently occupied. Because of their easy installation, user convenience and maintenance-free operation, occupancy sensors are one of the most preferred lighting control solutions. Our line of GE Aware™ Occupancy Sensors allows you to conserve energy and save money when illumination isn't necessary, while minimizing occupant annoyance caused by false activations or scheduling. Designed with flexibility in mind, GE Aware Occupancy Sensors can be used as standalone units for local control or as part of a greater unit, like the GE LightSweep™ Modular Lighting Control System. The design of the room and the amount of activity happening within the space will determine the level of sensitivity you need in your sensor. GE Aware™ Occupancy Sensors are available in three distinct technologies, so that you can be sure to find the appropriate solution for your space. Ultrasonic - Ultrasonic sensors detect occupancy by emitting a high-frequency signal and interpreting changes in frequency as motion. Ultrasonic sensors do not require a direct line of sight, meaning they can “see” around corners and objects. They are also highly sensitive to motion – even minor hand movement. Passive Infrared (PIR) - Designed to detect motion from a heat-emitting source, PIR sensors switch lights On and Off when a person enters or exits their field of view. Dual Tech - Dual Tech sensors combine PIR and ultrasonic technology. Lights are only activated when both sensors detect occupancy – eliminating false activation – and require one of the technologies to keep the lights on, significantly reducing the possibility of a false deactivation. GE Aware™ Occupancy Sensors come in four mounting options. The kind of sensor you choose depends on the type, size and function of the space. Ideally suited for On and Off control of small and medium spaces, GE Aware™ Wall Switch Sensors are designed to replace a standard wall switch to provide enhanced automatic switching based on occupant motion. GE Aware™ Corner/Wall Sensors attach either directly to the wall or to a corner between two walls. Corner/wall sensors are used for similar applications to ceiling sensors, but sometimes offer a more convenient mounting location. GE Aware Ceiling Sensors attach directly to the ceiling in the center of a room. They work best in large, open spaces, spaces with obstacles such as partitions, and narrow spaces. The GE Aware high-bay series of occupancy sensors is specifically designed for high ceiling applications including warehouses, distribution centers and much more. A key component of lighting control is maintaining a light level consistent with daylight. As natural light enters a space, GE Aware™ Photo Sensors reduce artificial light levels. When the sun goes down, or on a cloudy day, light levels increase. Including GE Aware™ Photo Sensors as part of a complete control unit – like GE LightSweep™ Modular Lighting Control System – will yield the maximum flexibility and energy savings. Need a retrofit option? The GE Aware Stand-alone Photo Sensor wires directly to a GE 0-10V dimming ballast with no need to connect to a centralized relay panel. Offices with windows or skylights, large atriums, retail or manufacturing spaces with skylights and outdoor site lighting.